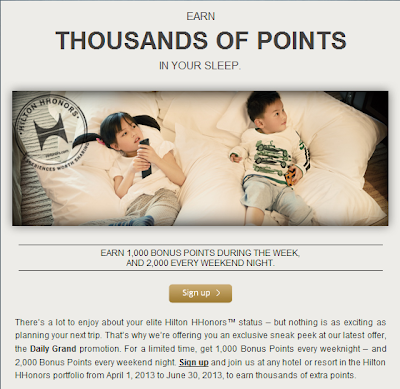 Just got this email today about the Daily Grand promotion from Hilton Hhonors. Pretty self explanatory: 1,000 bonus points per night for weeknights and 2,000 points per night for weekend stays. Looks like it might be targeted to elite members (I'm Gold). Seems like a pretty good deal if you have a stay already planned but isn't something that I'm going to go out of my way to use. There appears to be no limit to the number of points you can earn. I believe that this is a preview of a promotion that will soon be available to everyone regardless of status. Offer valid for eligible stays completed between April 1 and June 30, 2013 ("Promotion Period") at any participating hotel in the Hilton Worldwide portfolio. Hilton HHonors™ members must first register at HHonors.com/DailyGrand prior to check-out of their first stay within the Promotion Period. Registered HHonors members will receive Bonus Points only for nights completed during the Promotion Period, regardless of a check-in date before the Promotion Period begins or a check-out date after the Promotion Period ends. Registered HHonors members will earn 1,000 Bonus Points for each week night of their stay during the Promotion Period and 2,000 Bonus Points for each weekend night of their stay during the Promotion Period. For the purpose of this offer, “weekend night” is defined as Friday, Saturday, or Sunday for all regions except for hotels within the Middle East and Africa where “weekend night” is defined as Thursday, Friday, or Saturday. There is no limit to the total amount of Bonus Points earned during the Promotion Period. Bonus Points earned on Base Points do not count toward tier qualification. Please allow six to eight weeks from completion of your stay for points to appear in your HHonors account. Offer is not transferable and cannot be combined with other select offers.